Some choices are more important than others and some have long-term ramifications. Sometimes our choices backfire and sometimes our choices are just plain wrong and we suffer the consequences, but we are still free to choose whatever we want. So why can't we choose our gender? Despite all the scientific evidence to the contrary, the anti-transgender crowd claims that transgenders choose to be transgender just like the anti-gay crowd claims that gays choose to be gay. And according to those crowds, making those choices is wrong. I am a feminine man. My speech and mannerisms are a bad fit in boy mode, but in girl mode, I am a perfect fit. I could man up and never wear a dress again, but I chose not to do male drag. So, yes, I made a choice to live authentically and not fit in with the boys. But what if I was not transgender? What if I was a guy with no gender issues, who carefully weighed all the options and decided that living my life as a woman was preferable to living my life as a man. And as a result, I chose to live my life as a woman. It is just another choice. Admittedly, it is an big choice with a lot of long-term ramifications, but humans make important choices everyday. 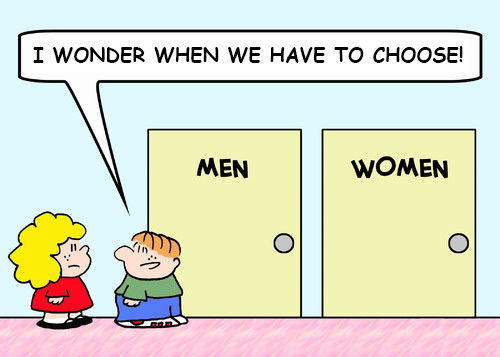 That's why God gave us intelligence and free will ― so that we can make choices ― like choosing our gender. Who we are isn't a concious choice, what we do with who we are is. 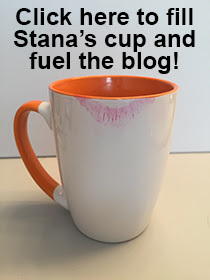 I love your points Stana, as the reflect on the bigger right and wrongs that people get hung up on. Especially those with limited thought processes and struck adheances to the letter of the word or laws from within their groups ideologies and faith based prejudices. I think I've mentioned this to you before, but we as a new and modern society suggest to women that they can be and do all to their hearts content, even if they contend to be happy wearing boyish looking outfits and short hair. Juxtapose this new attitude with men, and we are still living in the dark ages. Society makes it a point to have certain and limited ideals and expectations for men. Dare he venture outside of that social expectation and he is in deep do do.! I suspect that there are a number of boys and men that don't fit the cookie cutter design that's still only available to men. Who aren't trans anything, but just feel a little less then masculine, that don't get the rough and tumble football jock aggressive CEO warrior mentality. But there is no place for them to go? So sad that we still have to have a male liberation? And what would people even think about that, what men aren't being oppressed they don't need liberation? Ah but they do? They need to feel safe? Safe not having to be what society expects them to be? To be free to be what they feel deep inside that feels so warm and fuzzy to them. Yes putting on a dress may be a choice, but that desire to be what you feel you are was never a choice. I hope living conditions improve in the future as the younger generations mature, but I have my doubts. At the Trans Ohio Symposium a couple of weeks ago, the preponderance of 20 somethings young at the conference...prefered to not label themselves at all. During my life I may be able to witness the rise and fall of such terms as transgender. How welcome and exciting that would be!!! I saw the same thing with a couple of "youngsters" attending Fantasia Fair last year, which is a breakthrough for the Fair, which is mostly attended by older folks. In many cases it is circumstances that dictate choices. Everyone has to assess their own situations, proclivities, desiers, emotions, needs and attributes and make their own choices as to how they can be all that they can be. Yes - sometimes the envelope is sealed so tightly that escape is impossible, so you have to do the best that you can inside the envelope. "What if I was a guy with no gender issues, who carefully weighed all the options and decided that living my life as a woman was preferable to living my life as a man. And as a result, I chose to live my life as a woman." Then you'd have gender issues and you'd be transgender, no? The choice is between living as you are or hiding it. The cisgendered have no decision to make. The rest of us do, and that's the choice. You make a good point, Meg. But what I meant by "a guy with no gender issues" was a guy who was not feminine and/or was not a woman born in a man's body, who just decided that living as a woman was preferable to living as a man for whatever reason.